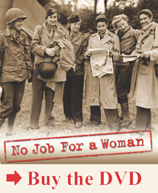 In 1917, twenty-five years before Ernie Pyle would popularize reports about the daily lives of soldiers, Peggy Hull went to Europe to report her version of the “woman’s angle”—personal stories about events in the daily lives of soldiers behind the frontlines. A reporter since 1901, Hull signed these articles as simply “Peggy”. They were published initially in the Paris edition of the Chicago Tribune and then, because of their popularity, in the Chicago edition as well. In 1918, after repeated attempts, Hull became the first American woman to become an officially accredited war correspondent.